Chef Natarajan Kulandai The Man Behind success of Taj group of Hotels in South India. 'Gods own country " termed for its natural beauty . Our Star Chef If there was no lobby chef Natarajan would be one of the greatest India has ever seen. I have high regards for chef oberoi, chef saraswat , chef satish arora and all. But the passion and dedication i experienced in chef Nat is unmatchable. Taj could have given much more to chef Nat. He is the one chef single handedly given Taj hotels its prominence in south India. Chef Natarajan personally heads and introduced Low glycemic food concept in Taj hotels mainly in south. even in london when i worked with sofitel they introduced only around 2014. Chef Natarajan did in 10 years before.
" even by physique he is a small man but his presence make's a man of 6 foot tall chef nervous"
Chef Natarajan Kulandai Chef 'Nat' How chefs and people know him calls. For me he is a Legend in terms of any culinary measurement of international standards. Its my greatest Privilege to write about him in our first issue . I am very grateful for a life he has open the doors. i believe its because of his presence in the interview panel who took me as a Management trainee for Taj group of Hotels In chefs batch. the north Indian lobby prevails high in Taj group . it still does. such was his Aura and confidence . "Unconfirmed story about chefs dedication i heard. while he was Executive head chef of Taj coromandel and Queen Elizabeth II was in house. a tragic death of a close family person happened to chef. he not only postpond the funeral and stayed back to ensure his responsibilities are done to fullest"
Chef who stays behind curtain and let his team takes credit. chef natarjans pet project that 'spa cuisine' that promotes healthy or to be honest a positive eating. he has brilliantly developed indian recipes with low calories, low glycemic (low sugar level) food that is combined well with spa treatment . while i was working in taj hotels few selected chef become part of chef nat team to Introduce spa cuisine in our respected Hotels. "MY SINCERE GRATITUDE TO WORK WITH CHEF NAT ON TAJ SPA CUISINE PROJECT"
Introduced spa cuisine in Taj Hotels chef is till going strong recently i saw a video footage of chef nat. his enthusiasm and vision for indian cuisine is till at great heights. chef natarajan pioneered the Much appreciated southern spice restaurant in Taj coromandel. it is still a great success in Indian restaurant world. The quality and technique is at par with any classical french Michelin rated restaurant. I first met chef nat during my final round of taj management Training Interview. The only question he asked me was "why you want to specialise in Indian cuisine"
The answer still gives me the fire . " To Make Indian cuisine best in world, present picture perfect Indian food which is already tastier "
its natural beauty. When considering international recognition for Indian cuisine Kerala has not yet received its deserved place. effective in terms of producing fantastic dishes. now one of the best destinations in the Asian Pacific. September. The festival is meant to celebrate the annual homecoming of the king Mahabali. The festival happens for ten days, and colourful floral carpet is laid in front of every house during these days. Families serve a traditional meal called “sadhya” during this time, especially on the nineth and tenth days. The meal is served in the traditional way in banana leaves with around twenty to twentyeight dishes. Vishu is the traditional new year’s day of the state and is another traditional festival occasion for Kerala. Vishu has a lot of significance for Hindus, as Vishu marks the astronomical New Year. People believe that Vishu is the festival that brings prosperity and calm to life. This festival falls in the month of April and is considered the most auspicious day of the year. Even on this day, a traditional meal or sadhya is prepared by the women of the house, and the whole family has the lunch together. Kalaripayattu is one of the oldest form of martial art, which originated as a style in Kerala, southern India . The word kalari first appears in the Tamil Sangam literature to describe both a battlefield and combat arena. Kerala Cuisine Kerala food is moderately spicy in nature, but most flavorful, and its recipes promote locally grown ingredients for cooking. Kerala is the home of kera known as the coconut tree. Coconut is the base for many dishes and is used in almost every dish in Kerala. Coconut oil is used for cooking. The oil is extracted from the dried coconut or “kopra.” Grated coconut and coconut milk are widely used in dishes for thickening and flavoring. Rice and tapioca (cassava) are the most common foods of Kerala. Varieties of main dishes are made with these two. Seafood is also one of the very famous foods. Fish, crab, shellfish, lobster, and prawn are used for everyday cooking. Sardines and mackerel are the most commonly used varieties of fish. The different meat varieties used in Kerala kitchens include poultry, red meats, and a few game birds (now restricted by law). Kerala breakfast shows a rich variety. Most of the breakfast dishes are made from rice flour. Some of the breakfast dishes are appam, idiyappam, idli, dosa, and puttu. Along with this, some of the side dishes are made with coconut. TURMERIC TURMERIC IS ONE OF THE MAIN SPICE IN KERALA CUISINE AND HAS AMAZING MEDICINAL VALUE. Turmeric has great antiseptic values. I remember an incident at my college days where one of our chef Instructor accidentally slit his finger while cutting onions. He started shouting for turmeric . we thought it was for cooking later found out he applied to the wound and it stopped blood loss. family. You'll sometimes hear turmeric being referred to as Indian saffron since its deep yelloworange color is similar to that of saffron. You'll also sometimes hear it being referred to as curcuma, after it's best-studied polyphenolic component, namely, curcumin. Turmeric has been used throughout history as a culinary spice, herbal medicine, and fabric dye. At home in india when there is disturbance from ants my grand mother used to sprinkle turmeric. i personally witnessed ants used to avoid or change their path when they came near to Tumeric. About 800,000 tons of turmeric are produced each year, with over 75% of this total amount coming from India, which is also the world's largest consumer and exporter of turmeric; in terms of exports, over 50% of all global exports come from India. Nutritional Value Turmeric is an excellent source of both iron and manganese. It is also a good source of vitamin B6, dietary fiber, copper, and potassium. Phytonutrients in turmeric include curcumin, demethoxycurcumin, tumerones, and tumenorols. detoxification, studies on turmeric intake now include its potential for improving cognitive function, blood sugar balance, and kidney function, as well as lessening the degree of severity associated with certain forms of arthritis and certain digestive disorders. Use of turmeric in recipes can help retain the betacarotene in certain foods. For example, one study has shown that the beta-carotene in carrots and pumpkins is better retained when those vegetables are cooked using recipes that include turmeric. marinate with turmeric and salt, pan-fry with coconut oil to sear evenly, and set aside. Avoid stirring; rather, try moving pieces by moving the pan. Add halved baby plum tomatoes; simmer for 15 minutes over low heat without boiling. for a minute.Add chopped green chili; sauté to remove the raw chili flavor. Results are better when consumed after an hour, when flavors are settled properly. we have been bestowed with an opportunity in redesigning a modern Indian restaurant menu. Dishes planned around local produces sourced around London. Intense research has done when planning and compiling menu for the restaurant. the concept brief given at the initial stage is for small Indian sharing plates. London restaurants are trying this small plate concept based on Spanish tapas style food. where guest has wide variety of choices with a low price tag. The portion is small mainly two bites , chefs can keep the price down due to small portion.In an ideal situation one person can three small plates and two sides .All will be equivalent to the price you pay for two course menu in similar London restaurant. Guest will feel highly satisfied as he gets an average of five dishes to taste where in normal scenario it will be two dishes. braised Angus short Rib. The meat is neatly trimmed, marinated and slowly braised with yoghurt in a preheated oven for 6 hours at a temperature of 150c . Once cooked the meat will fall apart. Rib is served with a garnish of Hispi cabbage subzi . we used hemp seed for giving a crust for cheese stuffed Naan . Hemp seeds is related to cannabis but a superfood with excellent nutritional value. 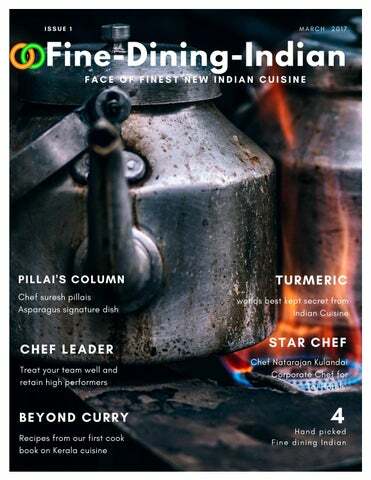 Here in this first issue of fine-dining-indian we have selected two recipes from our books one is from "Beyond Curry" and other from our New Book "Indian cuisine small plate Revolutoion"
starter. it has soft and sweetness from Guava . 1. Wash and cut the guava into 6 equally sized Crunchy and light spiciness from Kerala mixture. with lemon juice, chili powder and rock salt. 3. On a black plate, place the guava in a crisscross way as shown above. place the pink rose shoot and flowers. 5 No. Violet Flower You may use mango, melon, pineapple, apple or any other preferred strong fruit that’s doesn’t mush too quickly. Also, make sure that all fruit mixing happens towards the end. rinse on running tap water. into dices of 1 to 2 cm size. 3. Cut head in to two more part if the tentacles are too long you may cut in half. oil in a thick bottom pan, keep a spoon full oil on side to finish the dish. half of the curry leaf and green chili. Mix in cut calamari sauté for 5 more minute. Dilute all powdered spices in water or fish stock. this column as " Pillai's Column"
friends in setting up South Indian restaurants. Indian restaurant chef around the globe he knows them personally. group, Leela, which he credits with changing the course of his career forever. Squid pepper fry chef pillais classic Chef Pillai attribute his career success for the training he recieved while working in position of Commis Chef at Leela Palace Kempinski Hotel in Bangalore in 2004 . In his own words "Their rigorous standards, the high pressure environment, the learning curve, new skills – it brought an excitement to everyday job and ignited my passion for it.Then I went on to work as Chef de Partie at Kumarakom Lake Resort, part of a small luxury hotel group. There I oversaw the seafood section and the vembanad [fine dining buffet bar] "
"One of the humble chef in London Indian culinary world "
Wild Madagascar prawns, prawns kedgeree alleppey sauce - Innovative As a head chef he works alongside his team, supporting them on daily basis . He maintains a Good work organisation and constant training to achieve high service standards and consistency. He believed in using local and seasonal ingredients.He is a big fan of sustainability, probably because of his coastal roots. Asparagus a beautiful green vegetable coming to season and once in April it will be on its best. We Visited Talli joe on December 2016.
from all over India.Few of the dishes are quite new to Indian restaurant scene in London. after few weeks we dined . from most of London European palette Food critics. have at the dining Moment. Punch. Its not the spicyness . The flavour or aroma that was lacking in majority dishes. to locate and travel . The chef heading the restaurant is trained at the Oberoi hotels and previuosly worked at Benares Indian restaurant. Here we go and what we taste at Talli Joe. Black Carrot Halwa Black or Purple carrots the part of Heritage carrot originates from Turkey or middle east and asia. The dish Here is different from the traditional carrot halwa only by color or carrot choice. The peanut brittle or nougatine gives a nice crunchiness. It would have nice if accompanied with Rabri sweet condensed milk goes well together . "DISHES ARE INNOVATIVE BUT LACKS IDENTITY"
"BEEF FRY IS A GREAT PICK ON MENU"
Berry Malai An adaptation of berries and cream . Malai is Hindi word for cream or reduced milk . Not sure why it's called malai when the description says its baked yoghuty it should be Â 'Dahi'. The dish is light and well-balanced sweetness. Dark berries are fine in winter but strawberries not great pick for winter menu. "A LIGHT DESSERT WITH NO WOW FACTOR"
Bebinca Its good to see Indian restaurants focusing on Indian desserts than making con-fuision cuisine desserts like chocolate samosa, cheese cakes and so on. In India we have a great collection of desserts by chefs talent it can be bought fine dining scenes. BEBINCA is a classic goan sweet which has 7 layers. made with flour , egg yolk , sugar and Nutmeg . each layer is baked or ideally gratinated one by one on Top. Here the desert is nice bit on sweeter side than normal but very light than traditionally firm versions. "Bebinca has minimum 7 layers"
led by a lion "
and this means leading and motivating your workforce properly. In order to lead your staff, you need to be able to communicate: a vision of what the business stands for and where you want it to be through values. Priorities across the organisation what you as an individual intend to do to realise that vision and reflect those values what individual employees can do to realise your vision and reflect those values In order to motivate your staff. Work Harder Till your Dream become Reality LOVE FOR COOKING IS NOT ENOUGH Most of the chefs comes to the industry as a way to earn money when their study cant take the any further. Being a chef isone of the hardest profession. It is highly demanding mentally and physically. If you are not strong you are not going to last long in Kitchen. Each category of kitchen demand certain skills and knowledge. From a road side small outlet kitchen to Three michelin star rated high profile Kitchen. The rule is simple if you don't love what you doing you will quit. There is no easy way to success only Hard Hard Work and dedication to the profession . Modern Indian style Food Presentation Simple cooking techniques use of ingredients were you live your recipe will be given credit and linked to your webiste or Linkedin profile we ensure you will be promoted in a great way as our Guest editor . 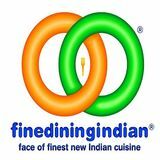 you can enhance your profile through contributing in our new Finedining-indian Magazine issues.